Microdermabrasion is a process of dry skin removal with mechanical exfoliation. The mechanical exfoliant has a diamond tip and a small vacuum device which gently scrubs the skin surface and vacuums the dead skin cells. This procedures goes very well together with oxygen treatment. Microdermabrasion is recommended once in every three weeks. In order to see significant results, a minimum of 4 - 6 treatments are recommended. Helps with fine lines, Hyperpigmentation (dark spot), Refines the epidermis, Increase cellular turnover, Dull and congested skin and Excess of oil production. 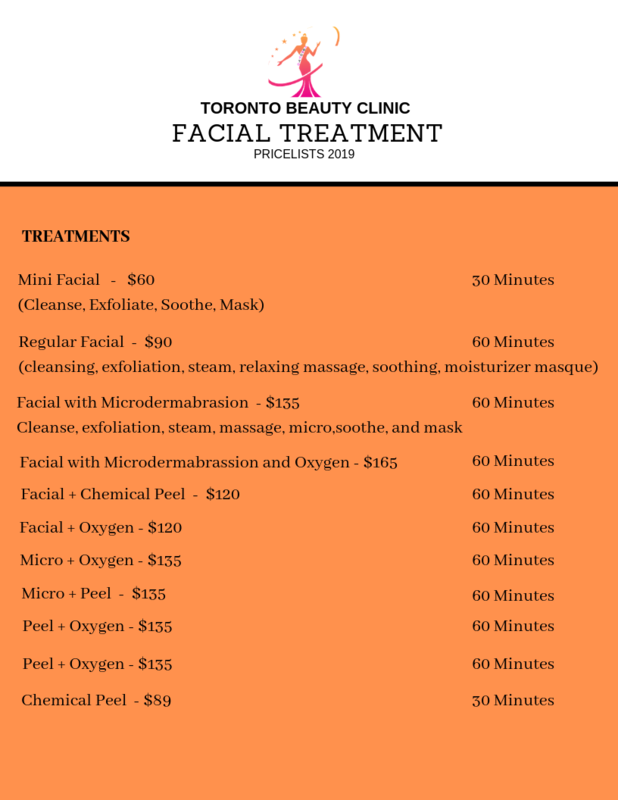 A chemical peel enhances and smoothes the texture of the skin, An AHA peel increases cellular turnover, and helps with uneven skin tone, Helps with pigmentation, Helps control acne/breakouts (however it may increase acne during the first few treatments), Eliminate dry skin(lactic peel), Chemical peel exfoliates the outer layers of dead skin, revealing a new skin layer with improved tone, texture, and color. What is the time frame and how many treatments? · Home routine must be followed to achieve maximum results. · Retinols and retinoid discontinue use for 7 days prior. It is a refreshing treatment of the skin in the area of the face, neck and décolleté. After the treatment the skin feels and looks relaxed and refreshing. Oxygen treatment goes well with microdermabrasion and photo facial. Oxygen treatment is recommended to do once a week.